Newly Discovered Mesolithic Crayon Is Among World’s Oldest #ArtTuesday « Adafruit Industries – Makers, hackers, artists, designers and engineers! 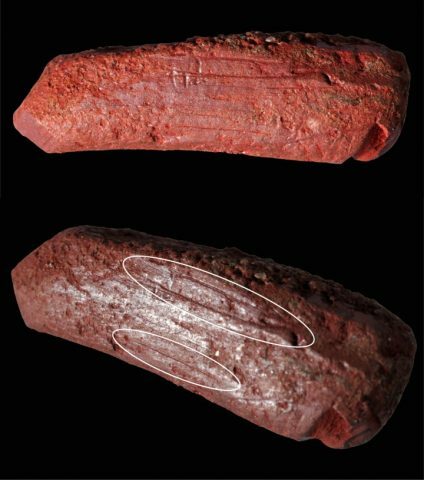 Archaeologists at the University of York say they may have found one of the earliest examples of a crayon: a 10,000-year-old elongated piece of ochre with a sharpened end. The tool was found near an ancient lake in North Yorkshire, a landscape with a rich Mesolithic archaeological record. Its finding might help archaeologists better understand how prehistoric hunter-gatherers worked with pigments. Just 22mm long and 7mm wide, the object’s surface has grooves and surfaces, as the scientists note in their study, published in the Journal of Archaeological Science: Reports. These lines are possible traces of someone using the object against granular surfaces, which would yield red marks. Its sharpened end also suggests that the piece was used as a kind of drawing or coloring tool. The archaeologists likewise found a small ochre pebble with deep striations, which they believe was used to harvest red pigment powder.